I have been drawing since my childhood and started painting in my early teens. Later, I began seriously airbrushing and acrylic painting at age 18, whilst starting my tattoo career. In my early 20's I've moved to the west of Canada and tattooed in Banff, Canada, at a local tattoo street shop for 7 years. At this time I met a lot of amazing traveling tattoo artists passing through the mountains, notably Randy Engelhard got me to notice his works he was achieveing with the Cheyenne HAWK. I have been using the Cheyenne HAWK Spirit for the last 6 years. I have been tattoing for 14 years and painted with airbrush in that same time. For me, the Cheyenne HAWK Spirit felt like the tattoo machine that brought my layering building skills with airbrush and tatooing into the same style. 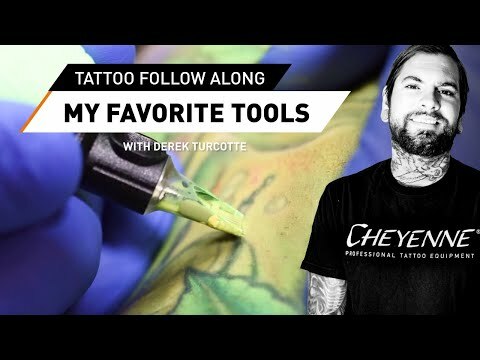 I find the Cheyenne tattoo equipment allows me to build my colors up in layers and build them lightly to full saturation in a gradual way that I prefer to do in my work. I think the HAWK Spirit leads to the illustrative realism I am hoping to achieve in my works! I love the way the skin heals from these tattoo machines and how they implement the colors over time. Around 2012, I was intoduced to the Cheyenne representative by Randy Engelhard and I received a setup to start tattooing with the HAWK Thunder. I loved this hard hitting tattoo machine and the needle cartridge system at the time was the easiest and safest system I had ever worked with to this point. Over the years, I softened my style of tattooing, so I have gotten more comfortable with the HAWK Spirit. From Banff, Canada, I moved to Canmore to work with Damian Robertson and friends, and then proceeded to open up the tattoo studio “Electric Grizzly Tattoo“ a couple of years later. I've resided in the mountains with my wife and daughter and get to work with amazing people everyday, lucky to have a lot of great guest tattoo artists working with us. To be able to learn a lot from them means the world to me. Besides tattooing, I enjoy painting, travelling, photography, boxing, snowboarding, pond hockey, gaming, and exploring life with my family.